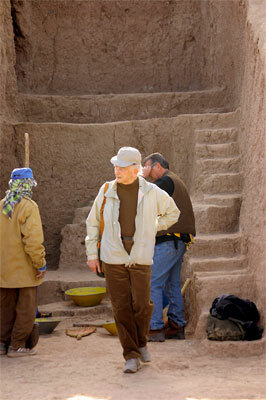 Tehran, Feb. 6 (Iranian Cultural Heritage News Agency) - Jean Perrot, one of world's greatest archeologists who headed the French teams working in Iran from 1968 to 1978, was among the invitees to the International Conference of Halilrood Civilization, held in Jiroft, Kerman, from February 1st to 3rd. Perrot, born in France in 1920, came to Iran in 1968, one year after Roman Ghirshman (great French archeologist)'s retirement, to head the French teams working on Iran's ancient sites. Since the beginning, he formed a professional team of experts from Iran, France, and the United States with diverse expertise who continued studying the sites until 1978. During his time in Iran, Perrot worked in areas such as Susa and Jafar Abad and discovered unique ancient items including the headless statue of Darius which is now kept in Iran National Museum. Moreover, during his mission in Iran the rule was changed according to which the discovered objects should have been divided equally between Iran and France. The new rule necessitated the relics be registered in Farsi and French and then handed either to the local museums or to Iran National Museum in Tehran. After returning to France, Perrot worked until recently as director of French National Centre for Scientific Research and since the work in Jiroft started, he cooperated with the team headed by Yusef Majidzadeh. When did you get acquainted with Halilrood civilization, Jiroft, and what did you primarily think of it? I was informed of the excavations in Jiroft almost from the beginning. Some time later, in 2003, I received some pictures of the objects found in the illegal diggings of the area. They were amazing. The same pictures were left unattended for 6 months on the desk of a archaeological magazine. Many people had seen the pictures but no one had paid attention. Maybe my personal interest was the result of my enthusiasm for the evolution of human thought, about which I have recently written a book. Actually the excavations in Jiroft could have made the first chapter of my book, a chapter that could have focused on the evolution of human thought in the third millennium BC, when he entered the era later called history. This threshold of history found in Jiroft is what is lost in the evolution course of the Mesopotamian civilization and is not that notable in that of Egypt. There are so many objects dating to this time found in the Halilrood Area, which can fill the gap in the formation and development course of the Jiroft civilization. Therefore, one can say that Jiroft is the capital of today's world archeology, because it allows the archeologists to correct or even rebuild the ideas they had on how people lived during that time of history. The part of history that was to day hidden in the strata of Iran's plateau is essential to rebuilding the base of world's history. What has been the most interesting aspect of the discoveries for you? What interests me most is the philosophy behind the designs made on the discovered stone tools and pottery. It is interesting for me to know what the creators of the objects thought and what they aimed at by making the items and inscribing the designs, and this can be understood by an analysis of the symbols and reasoning. If one or few objects were found, this wouldn't be possible, but with the great number of relics discovered in Jiroft, the conditions are completely different. One of the important aspects about the designs is that some of them represent the natural environment of the time, and the other factor is that the ancient artists who made the designs had some reason for having one specific tree or animal on the stones. Another aspect that is of great value is the peoples' imagination which has proved far beyond expectation; an imagination apparently belonging to all groups of society, which I call collective imagination, and has led to the design of creatures such as humans with horns, two-headed eagles, or a combination of humans and other animals such as bulls, lions or eagles. What has been the result of the studies so far carried out on the designs? Today with the help of iconography we can understand the concept of the designs and the thought trends of their creators. It is for example interesting to know that people in the third millennium BC represented divinity with creatures other than humans, such as two-headed ones. The symbols they created showed the divine superiority in their minds, but to find out the reason behind these needs more contemplation. Issues such as religion, art, and writing are all related and come to existence at nearly the same time. Religion can be divided to two categories: the personal one which is more primitive and the collective which manifests itself in more developed societies, and can therefore be said did not existed at some point in history. Collective religion is needed when the population rises and social classes form. Writing which was a tool for registering rules and regulations come to existence at the same time. Therefore, when inscription like the one that was found in the historical site of Jiroft some days ago, are discovered, we should not just pay attention to the fact that they date back to 2200 or 2300 years BC, but should point out to the fact that the creation of writing in a society needs a cultural social background forming at least since one millennium before. The same is true for religion and art. But has the creator of these designs on stone really meant to create some form of art? Actually the artistic understanding that we have of the object is more a result of our own viewpoint than that of the creator, who has not necessarily looked for art in his work. It is related more to his feelings, which are combined with some sort of unconscious aesthetic understanding, taking a concrete form by the person's religious beliefs. It can be said that for ancient people only religious rituals were of such importance to be inscribed on stone. Do you believe that we can categorize a special style of objects under the title of Jiroft style? To do this, we should first give a list of signs, forms, creation techniques, and materials used for Jiroft objects and then provide a specific definition of Jiroft style based on that list. As I said before, the creation of the objects was part of a religious ritual. The creator inscribed on them his beliefs with such precision that is not found in the fake objects made of Jiroft relics and can therefore help distinguish them from the real ones and also identify the real ones unearthed illegally and trafficked to the other side of Iran's borders. We now have lots of historical relics from Jiroft civilization which will help archeologists a great deal, however, to provide a detailed description of Jiroft style we need more objects to be discovered and we should wait until the excavation works headed by. Majidzadeh reach completion.